Want to be the first to know when new movies are released? Subscribe below and we will send you an email as soon as we release new movie events or any special offers. Come along to Bruce McLaren Motorsport Park of this amazing movie. Fun for the whole family while sitting in the warmth and comfort of your own car. 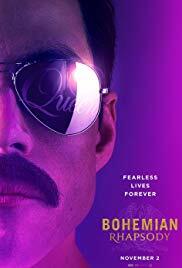 Bohemian Rhapsody is a movie based on the true story of Queen’s journey from the start of the rock band to their now-legendary 1985 performance at the Live Aid concert in Wembley Stadium. The story chronicles lead singer Freddie Mercury’s tempestuous journey from an outcast immigrant struggling to find his place in a rejecting society to his becoming a beloved and world-famous artist. Bohemian Rhapsody will start at 8pm. Entry for this movie will be permitted once any cars have left from the first movie at approximately 715pm. If you are wanting to buy tickets for both events, you will need to select your first ticket and click on add to cart…. This will take you to the checkout page, at the top of this page is a “head back to schedule page” hyperlink, click on this and go through the process to choose your second ticket. At the checkout enter the code taupo10 and this will automatically take the amount down from $50 to $40. Please read below for this event specific terms and conditions regarding refunds, cancellations and postponements. In the event of a cancellation before the original date, the purchase will be refunded directly to the credit card used for the original purchase. The event will not be postponed. If the weather makes the showing not possible, we will relocate to the Great Lake Centre Hall where the movie will play and you can BYO cushions and blankets. This will be announced by 3pm Friday 12th July. If for some reason the movie starts and then needs to stop due, efforts will be made to relocate to an indoor space, however if this is not possible by organisers then no refunds will be issued.